This natural tin mini star ornament will be a festive addition to your special occasion or holiday d�cor. This small 3-d star ornament will look beautiful on a Christmas tree and also makes a perfect gift for friends and family. 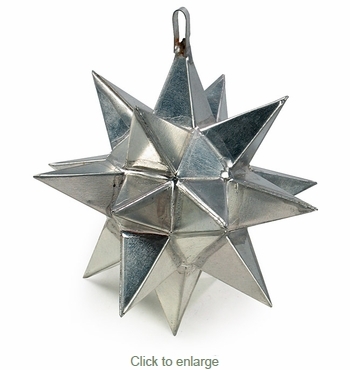 All of our star ornaments are carefully hand crafted by talented metal work artists in Mexico. Since each star ornament is hand crafted, variations in color and finish may vary slightly from what's pictured here.